Ten Speed Press, 9781607749783, 128pp. 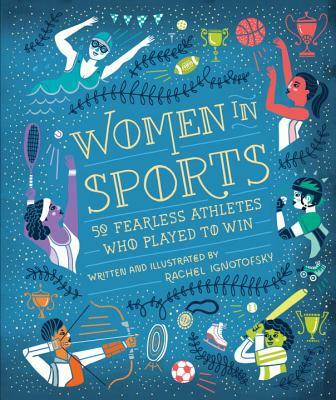 A richly illustrated and inspiring book, Women in Sports highlights the achievements and stories of fifty notable women athletes from the 1800s to today, including trailblazers, Olympians, and record-breakers in more than forty sports. The athletes featured include well-known figures like tennis player Billie Jean King and gymnast Simone Biles, as well as lesser-known champions like Toni Stone, the first woman to play baseball in a professional men’s league, and skateboarding pioneer Patti McGee. The book also contains infographics on topics that sporty women want to know about such as muscle anatomy, a timeline ofwomen’s participation in sports, pay and media statistics for female athletes, and influential women’s teams. Women in Sports celebrates the success of the tough, bold, and fearless women who paved the way for today’s athletes. "Exhaustive and enlightening—don't miss it." "This is one of the books we've been waiting for—a compendium of great women athletes and the struggles they faced. As Billie Jean King taught us, ‘Pressure is a privilege.’"
"This luminescent book tells the stories of women and girls who have not only excelled in athletics, but also often changed the world by doing so. I was agog at these lively biographies, and dazzled by the accompanying illustrations that seem to cartwheel, swim, pole vault, and double flip off the page. This is a book for girls who want inspiration on the field, in the pool, or down the track. It’s also for girls who aren’t sporty at all, but love stories of courage, perseverance, sass, doggedness, and fun. And don’t forget the boys, who will be riveted by these rollicking tales and who need to see that girl power has been alive and well for many years, and is alive and well today." "Rachel Ignotofsky's delightful book renders the healthy pleasure of sports for girls and women in buoyant color and form—from Bloomer Girls to Skate Bettys, in calf length skirts or disguised as men—reminding us that no matter if you are nine or ninety-eight, the question to ask is, ‘What is my next victory?’"
"What an inspiring book! These beautifully drawn portraits cover the triumphs and troubles of fifty athletes—some you've heard of and many you haven't. There's a familiar pattern to these stories: A woman sets her mind on something, someone tells her it can't be done, and she goes ahead and does it anyway, setting records along the way. You'll cheer for these ladies, and for author Rachel Ignotofsky."